As promised, or threatened, in a recent Ephems post about the impending demise of the Swan Hellenic cruise line, I have now put a not-too-serious diary of our first and last Swan Hellenic experience on this website (here), along with putting on the Web some photographs taken during the cruise (here). This Baltic cruise included time ashore in St Petersburg, Gdansk, Tallinn, and several Nordic capitals and other ports, prompting reminiscences about visits to some of these cities in earlier years, as well as reflections on the relative attractions and drawbacks of Swan Hellenic (resolutely serious and scholarly) compared with more down-market cruises (sometimes beginning to resemble Butlins-on-Sea). De gustibus non est disputandum, or anyway not much. If you're brave enough to view the pictures, here once again is a Dummy's Guide to navigating around them. When you have loaded the Flickr page of thumbnails (miniatures of the pictures), click on the first thumbnail to see a larger version, then click the left-hand thumbnail of the two (or three) over on the right of the screen to see the next one, and so on. To see any picture full size, click "All Sizes" at the top of the main picture; then use your browser's 'Back' button to get back to the previous screen for the next picture. To see all the pictures as a slideshow, click “View as slideshow” to the right of the three thumbnail pictures on the right of the main picture, underneath the heading “BrianB’s Photostream”. Otherwise just click whichever individual thumbnails on the first page that opens look worth viewing full size, remembering that there are three pages of thumbnails of cruise pictures (click 'Next' at the bottom of each). Brian replies: Since it's totally free, I can't imagine any reason for not going. The itinerary looks fascinating and the other passengers might not be quite as dry as they were on the Baltic cruise: anyway, no great harm if they are. Swan Hellenic dies in April so give it a go while you can! 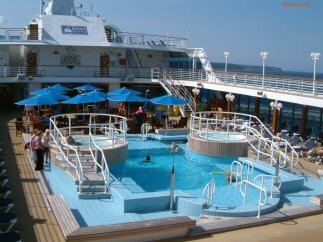 Most of the excursions are included in the basic cruise price. The good and bad features of cruising are best judged by each individual for him- or herself. Have a look at the main cruise websites (P&O, Cunard, Swan Hellenic, Princess, Saga, the Cruise Line, etc.) and decide for yourself.